Puerto Ricans love traveling their island during their spare time, doing what we call "turismo interno" (internal tourism). Given that Puerto Rico is a relatively small island, we need to come up with new sights and ways to enjoy the island and its many hidden spots. It is common for a new sight to be “discovered,” a new trail created, or a new beach turned into a favorite spot. These places become the “it” place to go for a year or two, and then slowly blend into the normalcy of most of the other sights on the island. Given how sights emerge from nothing and grow in popularity rather quickly, it is often hard to find them in traditional guidebooks or most web sites. But, being a Puerto Rican myself, I’ll share with you some of the best sights and activities that you won’t generally find in most guidebooks. This is one of the most popular activities right now in Puerto Rico. As you drive south along Highway #52, you’ll come across the iconic Tetas de Cayey Mountains. Right there, if you look straight ahead where the highway turns, you’ll notice a mountain with a single tree on the top. This is the lovely lonesome tree. The hike takes about 90 minutes each way along a steep incline that will get you to an elevation of 2,000 feet above sea level. Once you reach the top, you’ll see the lonely tree with its now iconic wooden swing. 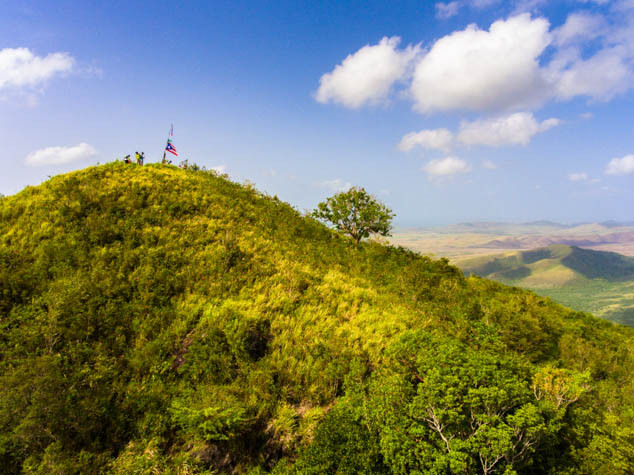 Also, you’ll get a 360-degree view of the surrounding landscape, including Las Tetas de Cayey. On a clear day, you can even see all the way to the sea. The hike starts from Highway #1 on the southwest side of the mountain. Since this is a “makeshift sight,” some locals let you park your car in front of their houses or their property for a small fee. El Yunque National Park is one of the most visited sights on the island, and yes, it is worth it. But, 99% of the tourists who visit El Yunque only go to the northern side. Even though the north side is the popular one with its famous Mina and Coca waterfalls, the southern side of the national park also holds some amazing secret spots. The reason why most tourists don’t visit the south side is because it takes longer to get there. On that side, you have the Salto del Hippy Waterfall (Hippy Jump). It is a stunning river with huge boulders popping out of the water from where locals love jumping – daredevil style. Depending on your comfort level, you can jump from about three different heights. This river usually gets full with locals during the weekend, when they go with the whole family and take their picnics, music, drinks, and sit there by the shore as relaxed as if it were their backyard. Located in between Aibonito and Barranquitas, the San Cristóbal Canyon is the deepest canyon in all of the Antilles Islands. Today, this canyon has been named as one of the top 10 natural wonders in Puerto Rico as it has one of the most beautiful waterfalls in the island. Plus, the hike there is quite an adventure through the lush forest and local farms. Surprisingly, this canyon didn’t look this beautiful until recently. From the 1950s up to 1974, this canyon was used as a dumping site, but in the last few decades, it’s been mostly cleaned to its original natural state. It's hard to imagine how this was once a dump site after seeing the blue-ish crystal water flowing down the canyon. It takes about 90 minutes each way to get from Route #725 to the base of the canyon, from where you can either swim upstream or hike along the river to reach the waterfall known as El Juicio (The Judgment). With a 240 feet drop, it is one of the tallest and widest waterfalls on the island. When it comes to good food, there is no shortage of options on the island. Among the most popular spots to eat local food is Guavate, which is often mentioned in guidebooks. Locals love it, and luckily it is still not overrun by tourists. But, there’s another alternative to Guavate. This food route has no official name, but we call the act of hopping between one food kiosk/bar to another as "Chinchorreo". This is a drive along the mountains in the center of the island, taking you from Bayamon in the north all the way south to Cayey. What locals do is stop at each kiosk to try their specialty, have a drink, or snack on anything they wish. Then they hop to the next kiosk to repeat the same process. Add dancing, chitchatting with locals, and you got a whole day full of local culture and food. These are not the only kiosks you can visit, but these are among the most famous. Piñones Beach in Carolina is quite famous now as being one of the most beautiful beaches with proximity to San Juan. But, sometimes Piñones can be overrun by locals and tourists alike. That’s when Vacia Talega Beach comes handy. This beach still gets its share of visitors, but what most people don’t know is that if you take the semi-hidden trail on the north of the parking area and walk for about 10 minutes along the overgrown path, you’ll reach a secluded beach that is almost always empty. If the first beach is busy, hike a few more minutes to arrive at the second beach. Then a third, and a fourth, and so on.